Christian missionary; born at Unterreichenbach, Hesse-Cassel, April 11, 1820; died in London May 13, 1885. He obtained his early education in Frankfort-on-the-Main, and at the age of seventeen entered a commercial house in Hamburg. In 1839 he emigrated to London, where he drifted into the Operative Jewish Converts' Institution, and was baptized in 1840, in the Palestine Place Chapel, later being appointed a missionary to Busrah and Bagdad. His duty was to found "a mission to the Jews in Chaldea and Persia," and he set out for his destination early in 1844. He worked as a missionary among the Jews for more than forty years, and traveled Mesopotamia, Persia, Arabia, Turkey, Abyssinia, and England. While in Abyssinia, where he won over many Falashas to Christianity, he was imprisoned by King Theodore, and remained a captive during the years 1863-67. He was ultimately liberated by an English force under Sir (afterward Lord) Robert Napier. A. 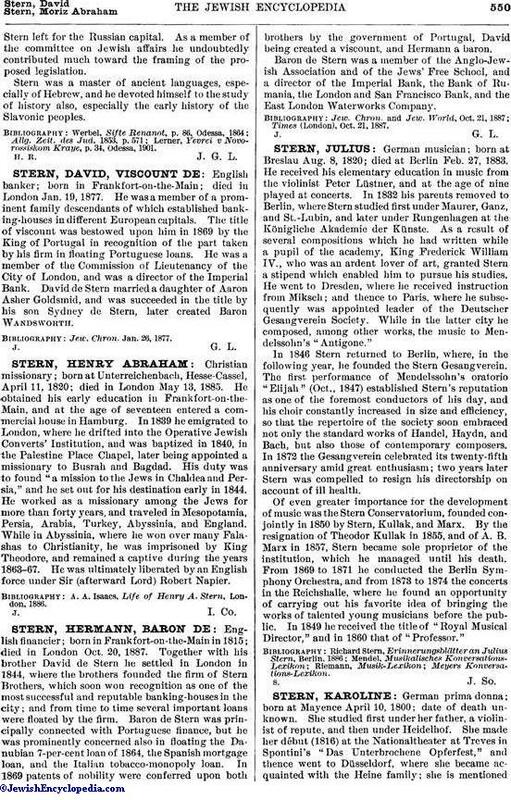 A. Isaacs, Life of Henry A. Stern, London, 1886.